Just as in another era, Dave Brubeck's Take Five expanded the rhythmic palette of swing, Mariah Parker's Indo Latin Jazz Ensemble takes Latin jazz in a new rhythmic direction. Her Indo Latin Jazz Ensemble mixes Latin jazz with the rhythms of India, featuring unusual arrangements of jazz standards and new compositions by Ancient-Future.Com Records recording artist, Mariah Parker. She released her first solo recording of her compositions, Sangria, in February of 2009. Her CD release party and debut of the Indo Latin Jazz Ensemble drew a full house at the famous Yoshi's Jazz Club in Oakland. 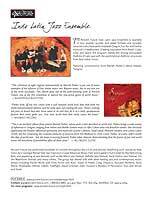 The Indo Latin Jazz Ensemble includes Ancient Future musicians along with top Indian musicians and jazz and Latin players who have performed with Sun Ra, Herbie Hancock's Headhunters, and Oregon. For example, jazz wind virtuoso Paul McCandless is known for his groundbreaking work with the seminal chamber jazz group, Oregon. Her 2017 release, Indo Latin Jazz Live In Concert, has received rave reviews and quickly rose to #32 on the JazzWeek radio charts! Indo Latin Jazz Live In Concert by Mariah Parker (Ancient-Future.Com AF 20142) $17.98: Add 1 to Cart. Buy 1 Now. iTunes. >YTmusic. Milo's Moment (Mariah Parker. 9:28).>YTmusic. This piece features a classic Afro-Cuban style montuno played in a 7/8 meter. From Indo Latin Jazz Live In Concert (Ancient-Future.Com AF 20142) $17.98: Add 1 to Cart. Buy 1 Now. Affinity Minus One (Mariah Parker. 7:40) >YTmusic. This piece started off as an exploration of a Latin rhythm, but Mariah modified it so that it's in a 15/8 cycle. After that, it gives way to a driving 4/4 montuno. Recorded at Yoshi's, Oakland. From Indo Latin Jazz Live In Concert (Ancient-Future.Com AF 20142) $17.98: Add 1 to Cart. Buy 1 Now. Jaguar Dance (Mariah Parker. 5:09) >YTmusic. Mariah loves dancing and felines, and decided to compose a piece of music that combines these two passions. 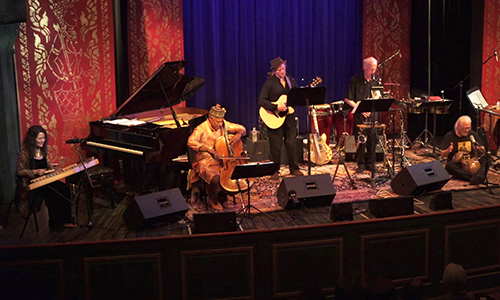 Recorded at the Freight and Salvage, Berkeley.From Indo Latin Jazz Live In Concert (Ancient-Future.Com AF 20142) $17.98: Add 1 to Cart. Buy 1 Now. Indo Latin Grooves: Focuses on blending driving, syncopated Latin grooves with the entrancing, asymmetrical meters of India.